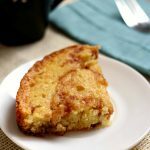 A scrumptious, moist and tender cake that is topped with a cinnamon topping and cooked in your crockpot. This is a perfect brunch idea! Grease your 6 quart slow cooker or spray with non-stick cooking spray. Make crumb topping: In a small bowl combine sugar, flour, butter and cinnamon. Mix lightly with fork until crumbly; set aside. Make batter: mix flour with baking powder and salt; set aside. In medium bowl, beat egg with a whisk until frothy. Then beat in sugar and melted butter until well combined. Add milk and vanilla. With wooden spoon, beat in flour mixture until well combined. Pour into greased slow cooker. Sprinkle the topping evenly over the batter. Place a double layer of paper towels on top of the slow cooker. This will prevent the condensation dripping onto the cake. Secure the paper towels in place with the lid. Cook on high for 2 hours, test for doneness with a toothpick. Cut, serve and enjoy! Alternatively you can make this coffee cake in the oven. Just pour batter into an 8×8 pan. Bake at 375 degrees F for 25 minutes.